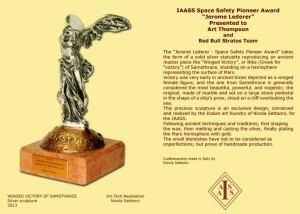 The International Association for the Advancement of Space Safety (IAASS) has awarded the 2013 Jerome Lederer Safety Pioneer Award to Art Thompson and the Red Bull Stratos team who made possible Felix Baumgartner’s recordbreaking stratospheric skydive in October 2012. “Art Thompson and The Red Bull Stratos Team have substantially advanced the human knowledge and capability for using high altitude parachuting as a means for ensuring safe crew escape during at least part of a space mission and possibly one day ‘parachuting from space’ in case of emergencies,” explains IAASS President Tommaso Sgobba. Art Thompson was Technical Project Director and the engineer behind the Red Bull Stratos capsule. Known for his creative approach to technical challenges, Thompson’s work has encompassed development of the B-2 stealth bomber for Northrop Corporation and design of the Batmobile for the film Batman & Robin. He co-founded Sage Cheshire Aerospace Inc., which took on the Red Bull Stratos challenge. The Red Bull Stratos team also includes space safety advocate and six-time NASA Space Shuttle crew surgeon Jonathan Clark who served as medical director for the undertaking, mentor and prior record holder Joe Kittinger, life support engineer Mike Todd, program manager and senior flight test engineer Marle Hewett, skydiving consultant Luke Aikins, and high performance director Andy Walshe. The Jerome Lederer Space Safety Pioneer Award is awarded biennially to an individual or group who has made outstanding contributions in the field of space safety. The award consists of a solid silver handmade statuette reproducing the “Winged Victory,” or Nike (Greek for “victory”) of Samothrace, standing on a hemisphere representing the surface of Mars. 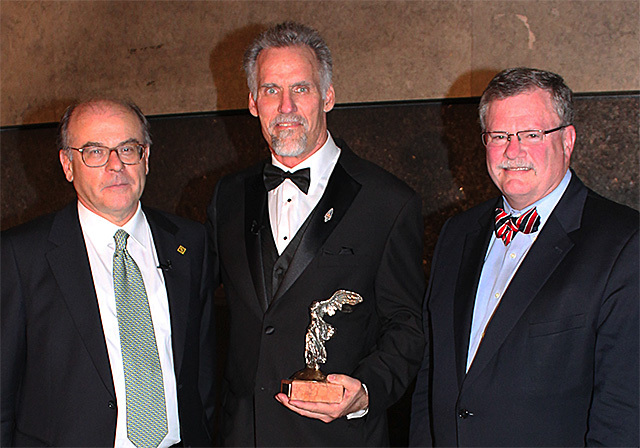 The award is named in honor of Jerome Lederer, an American aviation-safety pioneer. In 1947, Lederer organized the Flight Safety Foundation and was its director until 1967. In 1967, following the deaths of three astronauts at the Kennedy Space Center, NASA appointed Lederer director of the Office of Manned Space Flight Safety for the Apollo Program. In 1970, he became director of safety for all of NASA. The award will be presented at the upcoming IAASS Conference Gala Dinner on May 22 in Montreal, Canada.